INDULGE : Relax in a Sycamore Springs tub like Casey Moss. David Talmage will sing only in the lounge during the Central Coast Folk Festival. When it comes to Americana, we citizens are enthusiastic about celebrating our rich history, be it our politics, food, wine, music, or art. One needs only to consider the excitement among Americans across the nation over the upcoming presidential inauguration in Washington, D.C. for President-elect Barack H. Obama. This special event is attracting hundreds of thousands of Americans who will cross the country to be part of the monumental moment, according to the District of Columbia’s Presidential Inaugural Committee. Imagine the crowd this year when the 44th president of the United States takes the oath of office. Whether it’s the best of times or the worst of times (our current economy), we always have good reason to celebrate our heritage. Here on the Central Coast, you can celebrate President-elect Obama’s inauguration a weekend ahead by taking part in the first Central Coast Folk Festival being held at five of San Luis Obispo’s destination resorts. The team at the Boutique Hotel Collection, stretching from Morro Bay to Pismo Beach, has put together a four-day event packed with meals, musicians, art exhibitions, and storytellers—sure to rouse your appetite. Soak and Folk takes place one night only on a romantic, wintry Thursday evening. 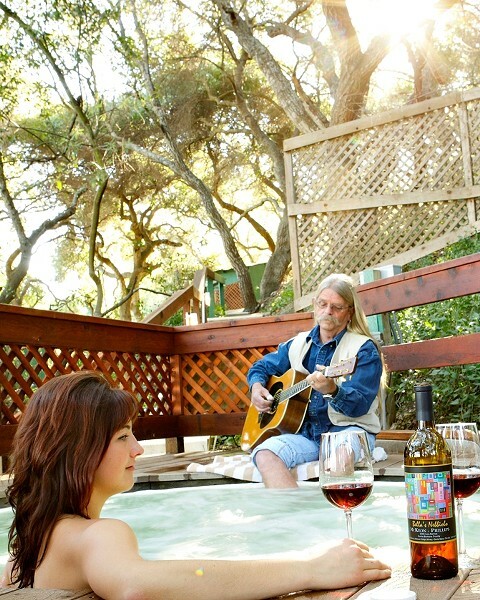 Imagine yourself in a warm, bubbling hot tub filled with healing mineral water, a fine bottle of Central Coast wine at hand, sharing the intimate setting with the love of your life. Later, you’ll both want dinner in the resort’s fine dining room, where they are offering a special American-heritage, three-course meal at an amazingly low price of $30 (not including beverages, tax, or tip; this special menu will be honored through Jan. 31 during SLO County Restaurant Month). For only $15 more, you can have three wines to taste, each one selected to complement one course. For example: swordfish tikka with saffron basmati rice paired with Tablas Creek 2006 Vermentino; and basmati pudding with whipped cream and pistachios with Bishop’s Peak 2005 Stone Cold Ice Wine. In the lounge, guests will enjoy the sounds of local musician David Talmage performing folk and acoustic music. There’s no cover charge and a special appetizer menu is available in the lounge to enjoy with cocktails or wine. The hot tub must be reserved in advance and dinner reservations in the dining room are recommended. An artisan market theme takes place here while the five-piece band Cuesta Ridge plays bluegrass, only $10 per person cover charge. Booths will be set up representing each of the five resorts, where guests can try various small plates of food. One booth will feature the chef’s fresh citrus margaritas, $5 each. Drinks aren’t included in the cover but can be ordered at the bar. Tickets can be purchased ahead or you can pay at the door. Local artists who display their work at SeaVenture will be there to talk about their art with guests. HERITAGE FESTIVAL: The Central Coast Folk Festival starts on Thursday, Jan. 15 through Sunday, Jan. 18, celebrating the American heritage of music, art, food, and wine. For more information and the entire schedule of events held by the Boutique Hotel Collection on all four nights, visit ccfolk.com or contact Casey Moss at 556-3306. At Marisol the heritage dinner takes place Friday night, Jan. 16, with a free concert by Jack and the Lion who’ll perform modern folk-rock music from 4 p.m. to 6 p.m. The gourmet dinner begins at 6 p.m. featuring five distinctive courses, each one paired with wine or a drink. Each course was created by a chef from one of the Boutique Hotel Collection resorts. For instance, Chef David McWilliam of Sycamore Mineral Springs prepared fresh Dungeness crab Louie with green goddess dressing and paired it with Ortman 2007 Chardonnay; Chef Gregg Wangard prepared the smoked rib-eye steak with pommes Anna, a Malabar pepper reduction, and paired it with Firestone Walker robust porter reserve. The entire dinner costs $70 per person including tax and gratuity—now that’s a good value. The array of foods on chef Stephen Walls “vittles prix fixe” menu is amazing. He’s giving you the opportunity to create your own three-course gourmet dinner by picking from four choices each in appetizers, entrées, and desserts. How about Caesar salad, homemade soup, BBQ pork, turkey mole tamales, or a Diablo bake with clams, shrimp, chicken, and Linguica in spicy tomato sauce on a bed of spicy rice? Desserts by the Apple Farm’s longtime pastry chef Willette “Willy” Vey include fruit cobbler, cream cheese pie, brownie ala mode and apple brown Betty ala mode, providing a sweet conclusion. Only $25 per person. There’s much, much more going on during each of the four days at these participating hotels. If you happen to miss the Central Coast Folk Festival you can still enjoy the unique dinners these chefs created through January 31 during SLO County Restaurant Month. Each of the hotels will be offering a special three-course dinner with a heritage theme for $30 per person without wine, or $45 per person with wine pairings (tax and gratuity not included). For details and menu samples from all of the SLO County participating restaurants visit sanluisobispocounty.com and click on the “restaurant” tab to get information about restaurant month. This is the rare occasion when being late for dinner doesn’t mean missing out on a fine meal. Bon appetit!